Jonathan D. Zuegel received the B.S. (1983) and Masters of Engineering (1984) degrees in Electrical Engineering from Cornell University. After serving in the U.S. Navy in the Department of Energy Division of Naval Reactors, he received the Ph.D. in Optics from The Institute of Optics at the University of Rochester in 1996. Dr. Zuegel is a Fellow of the Optical Society of America (OSA) and served as program chair and general chair for a number of conferences, including the OSA Advanced Solid State Photonics (ASSP) topical meeting, the biennial conference of the International Committee on Ultra-Intense Lasers (ICUIL) and the Conference on Lasers and Electro-Optics (CLEO). He also serves on the CLEO Steering Committee and several international advisory committees related to the Extreme Light Infrastructure (ELI) in Europe. Dr. Zuegel is Laser Development and Engineering Division Director and a Senior Scientist at the Laboratory for Laser Energetics (LLE) at the University of Rochester. As division director, Dr. Zuegel leads a multidisciplinary technical staff for developing and maintaining technology, custom equipment and the infrastructure needed to conduct research at LLE. His specific areas of research interest are in the fields of solid-state lasers, nonlinear optics, electro-optics and laser diagnostics. He is currently involved in laser research and development efforts including: diode-pumped lasers, optical parametric chirped pulse amplification (OPCPA), high-speed electro-optic devices for laser switching and modulation, fiber laser systems, and advanced laser beam smoothing. 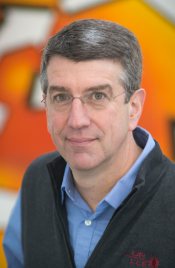 His research activities support advanced laser systems for laser fusion and high-field physics in the OMEGA and OMEGA EP lasers at LLE, as well as the National Ignition Facility at Lawrence Livermore National Laboratory.